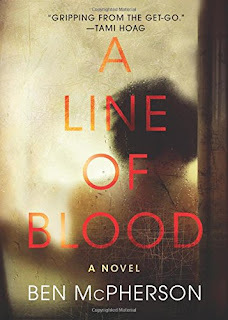 Ben McPherson's debut novel - A Line of Blood- is on my ever growing TBR list. The US cover is on the left and the UK cover is on the right. "A father and son discover their dead neighbor while searching for their missing cat. At first glance, it appears to be a suicide, but the police investigation suggests it may have been a murder. There are multiple suspects, each with a damning motive." Right up my alley. I'm going with the US this week. The UK is too realistic and almost lurid. I prefer the colours and blurred picture on the US cover. Do you plan to read A Line of Blood? Which cover do you prefer? I agree with you about this cover once again. My only negative on the US cover is it is vaguely similar to other thriller covers I have seen. But the UK cover is not appealing to me at all. 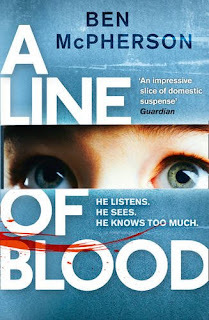 I had not heard of this book and author before I read your post, but it sounds great. I am really looking forward to reading your review if you read it. I think the U.S. cover is much more eye-catching. I'm not a fan of all the blue on the U.K. cover -- not to mention those (kid's?) eyes. Yikes!